The painter Charles W. Hawthorne was pretty much the founder of the early art movement in Provincetown, establishing the Cape Cod School of Art here in 1899. Most of Hawthorne's works that are probably familiar to the public seem to be those done in darker shades, depicting hard-working fishermen engaged in their daily activities, or often young boys going through their rights of passage into that same world. Probably the best known of all of these paintings is found in the heart of Provincetown, at Town Hall. The Crew of the Philomina Manta hangs at the far end of the hallway that leads between the town offices, toward the Judge Welsh Room. Stop in and notice the perceptive way the artist gets the feelings of these men onto the canvas. The expressions on their faces, and Hawthorne's attention to detail, are remarkable. 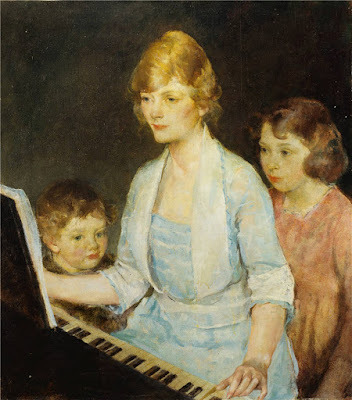 I also recently found a number of his paintings of women engaged in more domestic pursuits like sewing, or looking after the children, or giving music lessons, but without seeming sexist or stereotyped. He portrayed people of all sorts, caught in moments of their daily routines, engaged in the activities that ran the lives of Provincetown residents in the early 1900s. 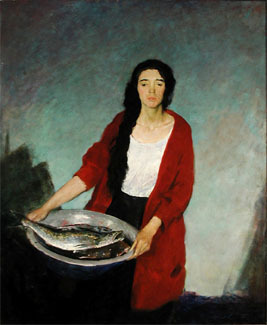 Here's a link to 24 Hawthorne Paintings I found on an absolutely amazing blog called It's About Time, where I began to discover paintings that portrayed women and children in the daily moments of their lives (not just the men) with a surprising number of wives, mothers, daughters, and young boys, wielding buckets of fish. 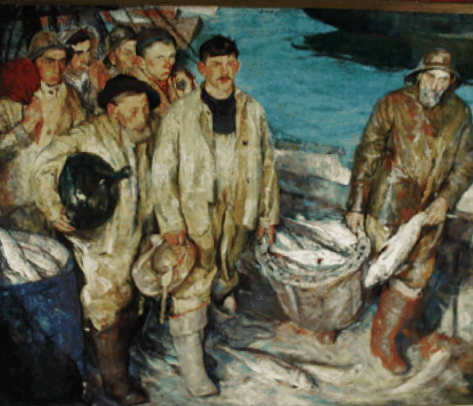 It seemed that everyone here in the early twentieth century was involved in the industry that supported this little village and fed it as well, with fish as prominent characters in so many of Hawthorne's paintings. In upcoming posts I'll bring you more of the remarkable character studies that are Hawthorne's works. I've unearthed dozens that I had never seen before, and I'll be sharing them with you on these pages. Meanwhile, stop by Town Hall and find the Hawthornes that grace the main hallway there, and enjoy the work of one of America's foremost artists and teachers.